Unlike most other birds of prey, such as hawks, falcons, and eagles, owls do not have crops, which are an expandable part of the esophagus where extra food can be stored. Therefore, owls will cache or store uneaten prey in a hiding place so they can eat it at a later date. This is especially important for small, high-energy species that must eat frequently. Since Northern Pygmy-Owls are active during daylight, they rely more heavily on their sight and less on their hearing, than many other owl species. As a result, they did not develop the good hearing, silent flight, and exceptional night vision that nocturnal owls have. 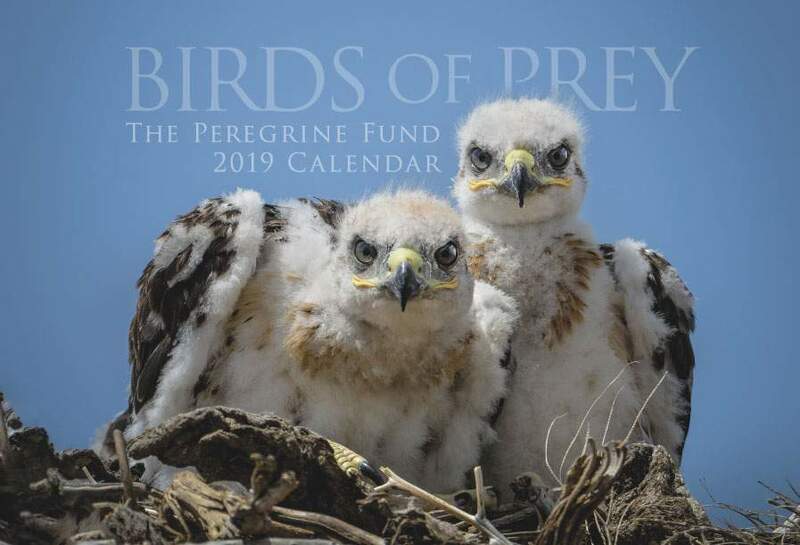 Though The Peregrine Fund doesn't work directly with Northern Pygmy-Owls, our efforts in scientific research, habitat conservation, education, and community development help conserve birds of prey around the world. We also supply literature to researchers from our avian research library, which helps scientists around the world gather and share important information on raptor conservation. The Northern Pygmy-Owl is found in western North America from Canada, through the USA and into Mexico, usually between 3,000 and 10,000 feet (950 - 3,000 m) above sea level. This very small owl lives in a number of different habitats including temperate and tropical moist forest, wetlands, savannas and open woodlands, most often near open areas including meadows or swamps. It is known to nest and hunt in dense forests, frequently near streams. The Northern Pygmy Owl is a tiny owl that grows no more than 7 inches in size and weighs only about 2 ounces. Individuals vary in color from brown to grey to rufous. The lower breast and belly are a creamy white covered with dark brown streaks. The top, forehead, and sides of the head are speckled with very small white spots - like a light dusting of snow. It also has "eye spots" on the back of its head. These two huge, dark spots are encircled by white and, as their name implies, resemble eyes. 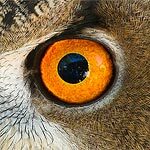 Some scientists believe that these eye spots confuse small birds that attack, or “mob” the owl, causing them to attack the back of the owl's head, rather than the owl's face. 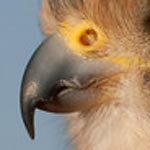 However, researchers also discovered that more developed eye spots might help discourage smaller birds from mobbing owls in the first place. Like the Flammulated Owl, the Northern Pygmy Owl is known for being somewhat of a ventriloquist. This means that it can be quite difficult to pinpoint the direction from where its call - a succession of cooing and thumping sounds - is coming from. Northern Pygmy Owl calling can last for a very long time - sometimes for hours. It can also be heard from quite a long distance - sometimes close to a mile away. Unlike most owls, the Northern Pygmy-Owl is diurnal - meaning it is active during the day, and frequently at dawn and dusk. Unique among the owls, the Northern Pygmy-Owl is not a silent flyer. When it flies, its wings make a buzzing or whirring sound. It flies in an undulating pattern, similar to that of a woodpecker. Northern Pygmy-Owls, like other owls, have asymmetrical ear openings. This means that one ear opening is located higher up on one side of the head, while the other ear opening is located lower on the other side of the head. There can also be one ear opening that is a bit farther forward on the head while the ear opening on the other side of the head is a bit farther back. The ear positions can be any combination of high, low, forward, and back! This helps owls better triangulate sounds, thus making finding prey that much easier. 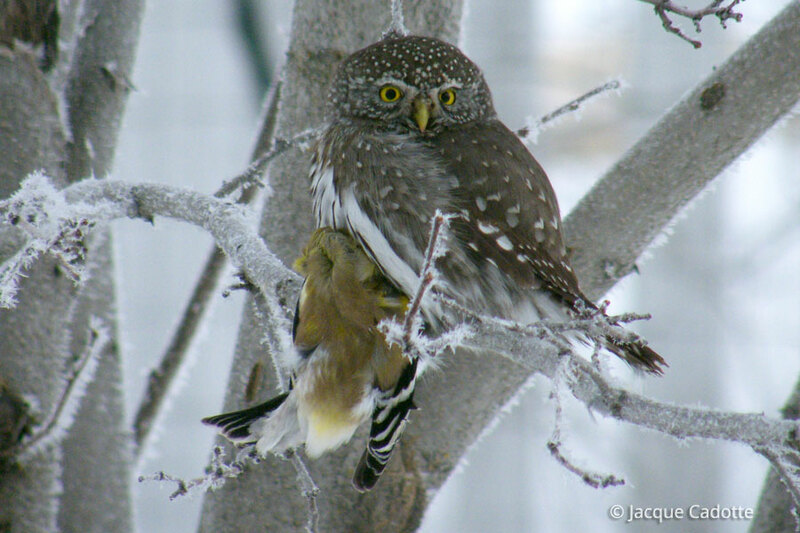 The status of the Northern Pygmy-Owl population hasn't been well-studied, but it is believed to be stable and secure. However, any changes to habitat that might have an affect on their prey, or on woodpeckers - which are responsible for excavating most of the nest cavities used by Northern Pygmy Owl - could lead to a decline in the species. 110–160 g - over twice this owl's weight! The Northern Pygmy Owl has other items on its varied menu, which includes rodents - such as mice, voles and shrews - and large insects. It might occasionally feed on reptiles and amphibians, as well. This owl hunts during the day and at dusk and dawn. It searches for prey from a strategic spot - a branch or a post that gives it a good view of its prey's movements. Once a tasty moursel is found, the owl pounces on it - usually from a close distance. The Northern Pygmy-Owl nests in tree cavities. In fact, it is what is known as an "obligate cavity nester" meaning it can only nest in holes in trees. Because this owl can't actually make the holes it needs to nest in, it relies heavily on openings made by woodpeckers or naturally-created cavities. The female will usually lay between 3-5 eggs. At this point, she is responsible for taking care of her eggs and making sure that healthy chicks are growing inside. She does this by incubating, or sitting on the eggs to make sure they are just the right temperature. Thoug she will take some short breaks, the majority of her time is spent inside the nest. She must do this for almost a full month - 29 days! But don't worry. The male has a tough job as well. He spends his time hunting for food for himself, the female and, once the chicks hatch - his offspring. It is a lot of work feeding so many mouths. Scientists have documented male Northern Pygmy Owls bringing food to the nest as often as every 2 hours. The young fledge after about one month after hatching. Like many cavity nesters, the first flight might vary between a short hop to a close branch in the nest tree, or a quick flight into a nearby tree. Like many young raptors, the first flights might be somewhat awkward and the landings are often more so. You owls may land - clinging to whatever thin branch or twig they first can grasp onto. They sometimes land upside down for a bit as they work out how to get upright again. But, in a very short time, juvenile Northern Pygmy Owls will soon become expert fliers. Despite their improving flying skills, they still rely on their parents to bring them food. After approximately three to four weeks after fleding, the young become independent of their parents' care and strike out on their own to find a territory and a mate. They are able to reproduce about a year later. According to the Idaho Fish and Game, very little is known about the status or distribution of the Northern Pygmy-Owl in Idaho. But, most likely, It is found throughout the state where suitable forest habitats exist. The World Center for Birds of Prey offers fun ways to learn about birds of prey. Interactive activities, tours, interesting videos and a children's room with activities from coloring sheets to quizzes to costumes. Owls are included among the ambassador birds at the visitor center, providing visitors with a wonderful opportunity to see owls up close and learn about the wonderful and interesting adaptations they have in order to survive in their respective habitats. There is also a touch table with owl feathers and other natural objects available for exploration.